Harry P. Leu Gardens can provide you & the family a relaxing morning or afternoon out away from all the tourist traps. The gardens are located north east of downtown Orlando. There's 50 acres of Botanical gardens to explore including a historic museum house built in the 1880s which was sold to Harry P. Leu & his wife in 1936. Once all plants had been established in the gardens they decided to share their passion for gardening by opening up the area to the general public. 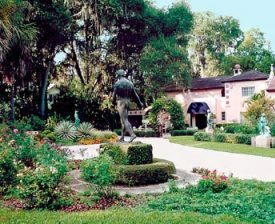 Such was the success and popularity of Leu Gardens, that in 1961 Harry P.Leu deeded his house and its grounds to the City of Orlando, provided they be maintained as Botanical Gardens for the public to enjoy. Leu Gardens Orlando is now on the National Register of Historic Places and has become a popular venue in Orlando. Three miles of paved walkways through lush tropical landscape including themed gardens such as the Tropical Stream Garden, the Vegetable and Herb garden, Rose Garden and Butterfly Garden. On-site historic museum house built in the 1880s. Gardens open 9am - 5 pm everyday except Christmas Day. No guests will be admitted to the Garden after 4:00 pm. Leu House Museum open 10:00 am - 4:00 pm with tours every thirty minutes on the hour and half hour. Last tour at 3:30 pm. Closed all July! $7.00 adults - $2.00 children. Free admission on the first Monday of every month from 9:00 am - 5:00 pm with last admittance at 4 pm. No pets allowed in the Gardens. When you're planning your visits to Leu Gardens Orlando and other Orlando gardens, you don't want to use old news and information. We will keep updating our site via our RSS feed. Simply click onto the RSS feed above and follow the instructions. It's an easy way to stay on top of what's happening in & around Orlando, free of charge.